Linked below are selected publications by Dr. John Kasarda addressing the basics of airport city and aerotropolis planning and development. Additional articles can be found on the publications link of www.aerotropolisbusinessconcepts.aero. Definitions, key components, and underlying drivers of the aerotropolis and aerotropolis model are presented along with planning principles, critiques, and counterpoints. The aerotropolis model is being widely adopted throughout China with more than 100 of its airports and their surrounding areas applying its principles. Leading the way is the Zhengzhou Airport Economy Zone whose remarkable achievements since 2013 in industrial investment, economic output, and aviation-linked trade have earned the reputation as China's Aerotropolis. Aerotropolis master plans to date have consisted mainly of elaborations of proposed commercial land use and urban design renderings along with recommendations for improved airport region surface transportation infrastructure. Much less attention has been given to the strategic, economic, and real estate investment issues that determine whether proposed aerotropolis commercial development would actually occur. A massive planned economic zone around Zhengzhou (China) International Airport is evolving geared to high-end manufacturing and modern business services. This zone is already the world's single largest platform for smartphone production. Factors contributing to its emergence and growth are described. The aerotropolis as a new urban form is highlighted along with its value proposition for firms and urban regions. The opportunities and challenges of developing Sydney’s second commercial airport are discussed. Recommendations and action steps are proposed to construct an aerotropolis around it as well as make the new airport financially viable. China is engaged in an airport construction boom that is transforming the country. The relative financial merits of the construction boom are discussed in terms of cost and ultimate returns to local and regional economies. Airports have become not just 21st century business magnets, but also regional economic accelerators, catalyzing and driving business development outward for many miles. International gateway airports are shaping business development and establishing new urban power centers around the world. The commercial anatomy of today's air gateways is examined and why they have become critical infrastructure for firms and regions to compete in an emerging era where economies of speed are as important as economies of scale and economies of scope. Aerotropolis planning principles are provided to improve (1) people and logistics mobility, (2) airport area land use and community development, and (3) firm and regional competitiveness. Focus is on creating new "economies of speed" in goods and services trade through better local and global aerotropolis connectivity with coordinated business siting. Airport City and aerotropolis development is gaining substantial traction, multiplying rapidly around the world. With cities now being built around airports, rather than the reverse, propitious opportunities await metropolitan regions that can marshal the vision, planning skills, and coordinated actions to capitalize on them. As air transport for leisure trips, business travel and goods shipment increased rapidly over the past several decades, the emergence of airport cities has been hypothesised. Busy commercial airports may be emerging as central transport nodes in large metropolitan areas, much as ports and rail terminals were in the past, anchoring employment servicing passengers, facilitating frequent travellers and providing a spatial focus for unrelated firms. An analysis of small-area employment data for the areas surrounding 25 major US airports and the related central cities reveals the concentration of employment within 2.5 miles of these airports to be substantial—approximately half that within 2.5 miles of the central point of the corresponding CBDs—and growing. The analysis refocuses a question about the nature of spatial differentiation within metropolitan regions supporting multiple employment nodes. Stephen Appold and John D. Kasarda are in the Kenan Institute of Private Enterprise, University of North Carolina, CB 3440 Chapel Hill, 27599-3440, USA. Email: appold@unc.edu and John_Kasarda@unc.edu. Brazil's Belo Horizonte International Airport went from stagnation to major growth success, but it took bold government decisions, and substantial investment in connecting surface transportation infrastructure. A new urban form is emerging worldwide that is shaping the competitiveness of metropolitan regions and nations. It is the aerotropolis, a city built around an airport which offers aviation-oriented firms speedy connectivity to their suppliers, customers, and enterprise partners nationally and worldwide. Aerotropolis: The Way We’ll Live Next? 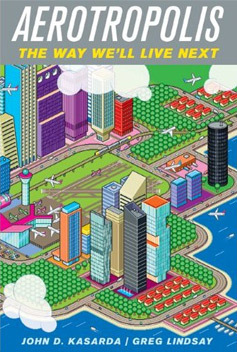 John D. Kasarda is co-author of the new book Aerotropolis, an astonishing treatise on the metropolis of the future and the integral role of the airport. Kasarda argues "Look for yesterday's busiest train terminals and you will find today's great urban centers. Look for today's biggest airports and you will find the great urban centers of tomorrow." In his career he has consulted with four White House administrations and advised companies such as Boeing, FedEx and Bank of America. He is professor at the University of North Carolina's Kenan-Flagler Business School. For a rare moment when he is not in the air, Atlantis asks him about the future of the airport, the city and the implications for the Netherlands. 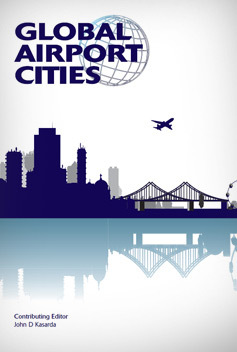 The first three chapters from the Global Airport Cities book are provided. These chapters include (1) The Way Forward, (2) Strategically Managing Airport Cities, and (3) Airport City Pioneers. Key components of airport cities and aerotropolises are described as well as strategic management issues. Once a place strictly for airplanes to take off and land, the modern airport has become something much more significant for any company, or region contemplating its economic future. Even in today's rocky economic times, airports and their immediate environs are becoming 21st-century commercial anchors, taking on many features of destination retail and urban centers. Social scientists view airports as quintessential "non-places". "Places" communicate identity, social meaning, and history while "non-places", lacking these attributes, are held to be anonymous, disorienting and off-putting. Cities flourished as seaports. Towns sprouted around rivers. Railroads opened the hinterlands, and highways connected suburbs. Now, the fastest-growing cities in the world are airport cities. Beijing and Dubai and Brisbane have already started listening to a UNC business professor named Jack Kasarda, who says that our nation's future is up in the air. The crown has been passed from Memphis to Hong Kong. Memphis, which had been the leading cargo airport every year since 1992, handled 3.9 million metric tons of cargo in 2010. Hong Kong processed 4.1 million metric tons last year – an increase of 23 percent over the previous year. Central America has lagged behind other regions of the world in airport city and aerotropolis development. This is about to change. Indianapolis International Airport (IND), handling a total of 7.5 million passengers and 1.05 million metric tons of cargo in 2010, received much more than a facelift in 2008. A new state-of-the-art airport was opened adjacent to the old one on a greenfield site a mile wide and over two miles in length. "International airline routes are the quintessential manifestation of 21st-century globalization. They are our high-speed physical Internet, moving people and products quickly and efficiently over long distances. Airports are its routers, attracting time-critical, globally oriented businesses of all types to their environs creating a new urban form – the Aerotropolis." "The aerotropolis is the physical incarnation of globalization made concrete in urban form reflecting local interfaces of worldwide airborne flows of people and products." "In today's turbulent, speed-driven economy, it is no longer the big eating the small, but the fast eating the slow." "Airports are not just trade facilitators; they are trade creators by quickly connecting businesspeople and high-value, time-critical products to distant customers and markets." "Cities used to be almost exclusively destinations and airports solely places of departure. Now airports are becoming destinations and cities places of departure as their residents and workers increasingly travel to emerging airport cities and aerotropolises around the world." "Under Global City 4.0, exports of knowledge-based, information-intensive business services – delivered to distant sites by air traveling auditors, consultants, corporate lawyers, investment bankers, marketers, and professionals of all types – will far eclipse the value of the Global City’s goods exports." "As our world becomes increasingly networked, ever-greater amounts of commerce will flow to and through its hubs, especially its major air hubs and the metropolitan regions they serve, creating a global hierarchy of aerotropolises established by the strength of air hub connectivity and resulting value of goods and services trade generated."